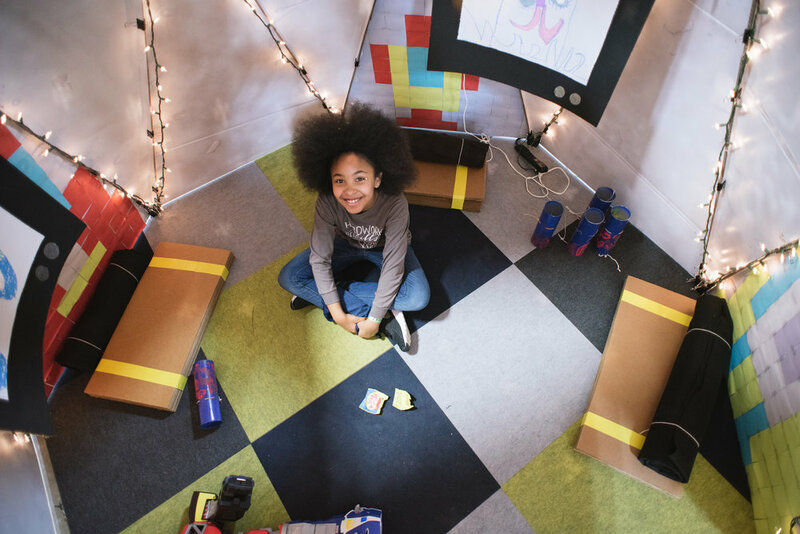 Why Designers in Chicago are Building Forts — Valerio Dewalt Train Associates, Inc.
At VDT, we’re especially proud of staff that make time to use their creative skill sets outside of the office and engage their local community. This week, we’d like to focus our attention on Refortify, an event which is especially important to Katie Hart and Amanda Davidson. The idea behind this wonderful program is simple. Over the course of 5 weeks, youth from Breakthrough Familyplex attend classes to learn about the design professions. Through various exercises and workshops, the students learn how to design concepts for a fort. 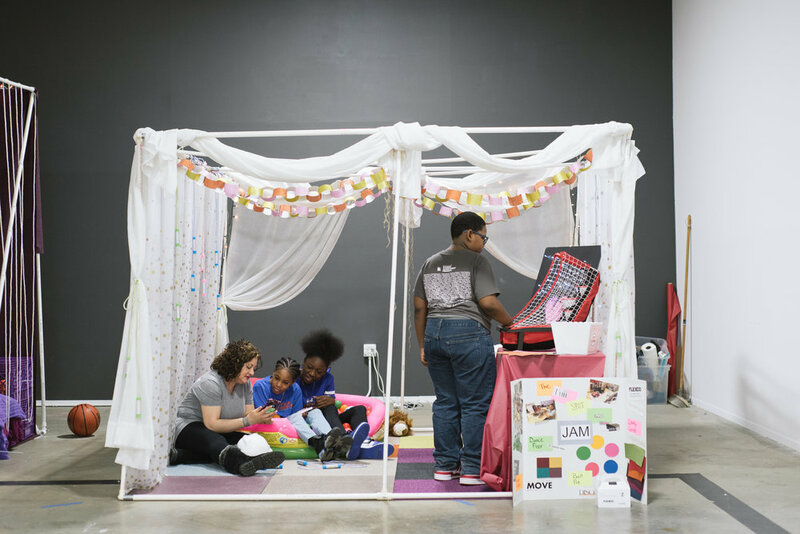 At the end of the program, the students are paired with design professionals who use the students' concepts to build a life-sized fort with donated clothing and materials. All leftover clothing and materials are then donated to Breakthrough and other local organizations. 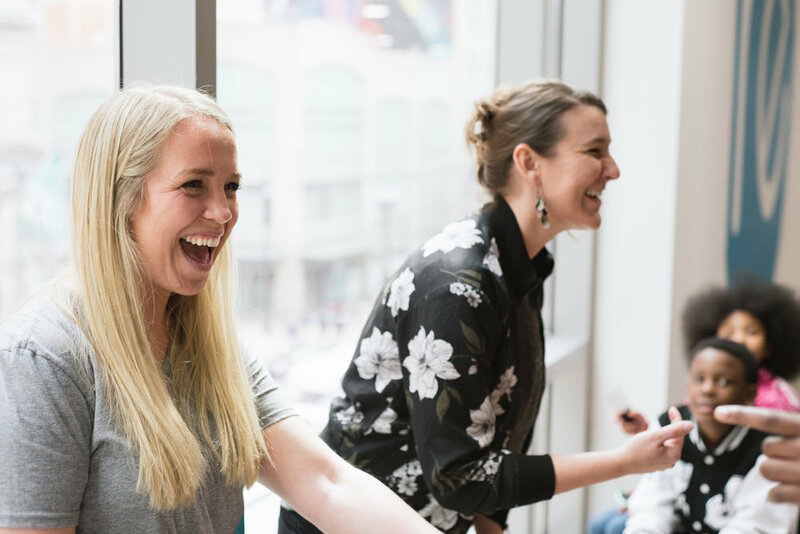 We sat down with Katie and Amanda to look back at this year’s event and understand why they feel this organization is so important to the community. Katie is a Project Manager at Valerio Dewalt Train. At refortify, she holds the position of Education Coordinator. How did you get involved with Refortify? This organization originated in Atlanta, Georgia and it was brought to Chicago five years ago. 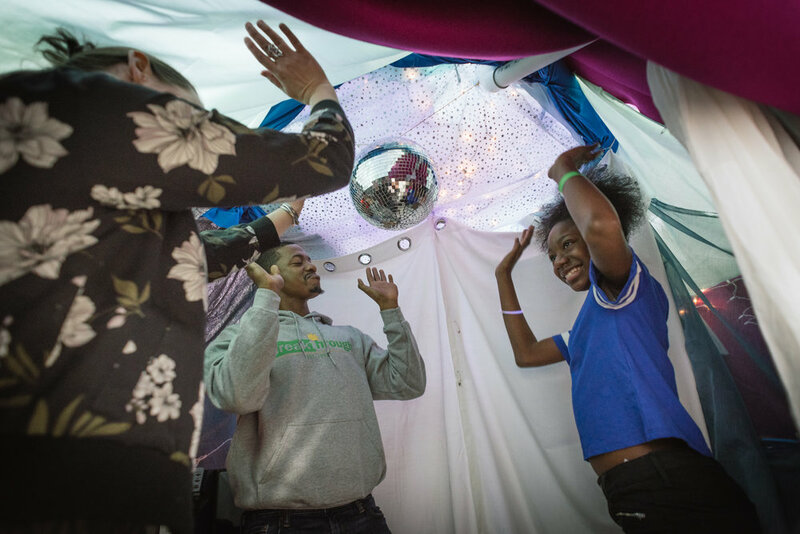 My former employer got me involved when it arrived, and we ended up designing a purple dance fort with a student. It was a lot of fun and I got really excited about the event and the potential of it. That first year I got involved in the planning committee and have since been in charge of education. I had experience working with high school students at IIT in their summer outreach program and did that for around six years. Having taught on and off since grad school, Refortify was a perfect opportunity to teach children that were younger than 15 years old. Why do you think that Refortify is important? It’s important for a few reasons. Firstly, we serve the East Garfield Park community. 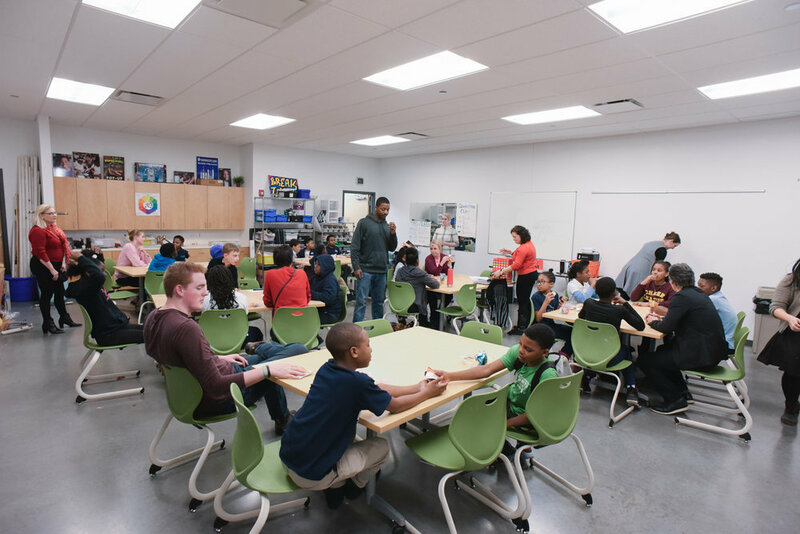 A lot of the students don’t have access to a variety of arts programs, so their exposure to architecture and design might only be limited to the classes that they take at Breakthrough Familyplex community center. Without a program like this, they might not even know that professions in this field even exist until they get to college. It’s kind of cool to open students eyes to abilities to create and design...and that their ideas matter. to help open student’s eyes to their own abilities to create and design." What do you think is successful about this program? Well, I think that it’s fun for the students because they can see their design come to fruition, and sometimes even in ways that they didn’t imagine. In some cases it can even be disappointing in the way that it comes out for them, because they’re learning about how to communicate to others and share their ideas in design. And this helps them with their communication overall. I think it's also successful for professional adults as well. It gives you an opportunity to reconnect with the community that you serve. Your client is not typical either, it’s a nine or ten year old instead and this process really brings you back to the roots of design. These are your ideas, how do we synthesize these ideas about how to design a mansion for example but in an 8’x8’ space. So you have to come up with clever ideas as a designer, on how to actually make these things come to life. All of this brings you back to the roots of design school, where you’re given a problem and you have to find innovative ways to solve it while given constraints. Amanda is a Designer at Media-Objectives. At Refortify she holds the position of Graphics Coordinator. One of my friends got me to join! I think that it’s really cool that we’re showing kids a new avenue that they can pursue rather than what’s instilled in you from childhood. A lot of kids dream of careers like being a ballerina, firemen or astronaut; and as you get older you begin to get drilled with more typical pursuits like a trade, accounting, or law. It’s not easy to see the creative career possibilities, especially those outside the general ideas of being an artist or a graphic designer. Looking back on my own high school experience, I definitely didn’t know about some of those niches that are out there. So I think that showing such young kids different availabities is important. "For all of the architects it’s also a fun twist because a little kid becomes their client." 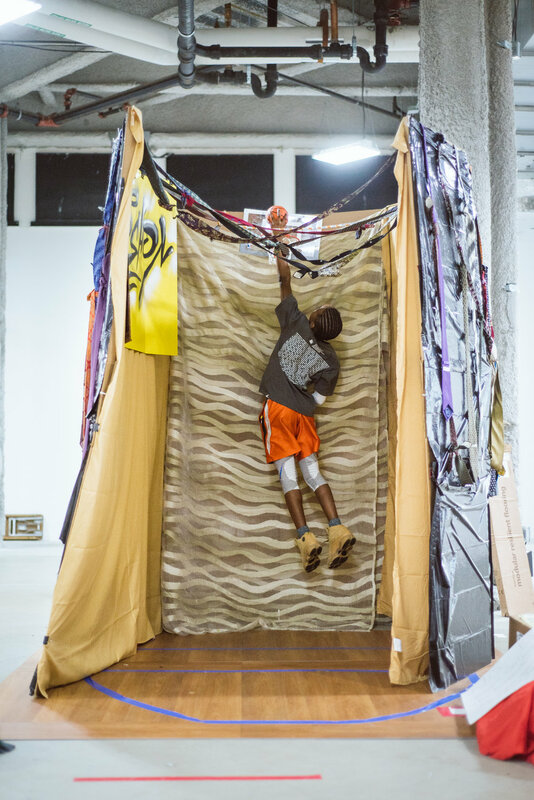 Well for example, when we brought Luft into the mix, the kids got to see people that combine a lot of different areas of art and design into this niche aspect of art installations. It’s very technical and detailed, it can also be whimsical and random, but there’s a lot of thought and planning that goes into it. There’s also structure and engineering involved. And I think that even just showing what Luft did in a matter of hours on site with the entrance to the Refortify exhibit, using only rubber bands and dowels...it's just a really great experience for these kids. For all of the architects it’s also a fun twist because a little kid becomes their client. They get their creative brief from a child, and their job is now to make it happen. One of the awards that the forts can win is ‘Best Interpretation of Concept,’ which explores whether they met all of their clients goals. I really love this aspect of the event and I think that it helps the kids feel a little bit more important, even for just a week or two. On Play Day, you can see it on their faces. They love it! The kids run everywhere, and go into all of the different forts and play with all of the new toys. Everything is also a donation that keeps on giving. Everything is just magical about Refortify.